This post was sponsored by The Home Depot and includes affiliate links. 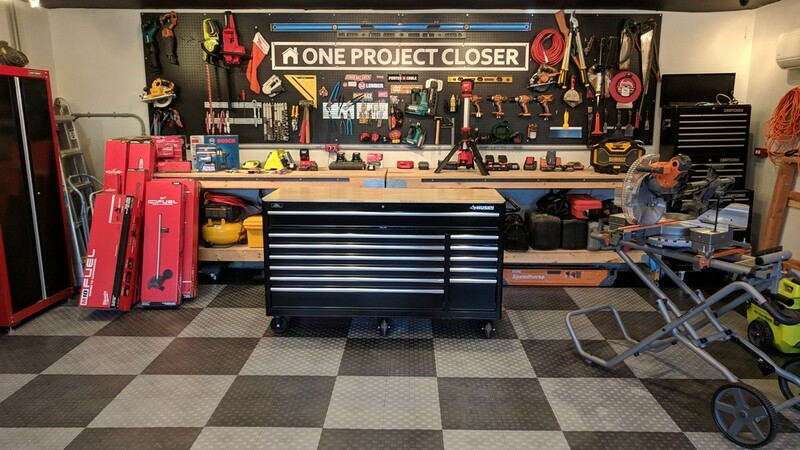 Last month (February, 2019) we installed Motordeck Polypropylene Garage Floor Tile from The Home Depot in our two-car garage workshop. We absolutely love the upscale look the tile provides for the space and how easy it was to install. 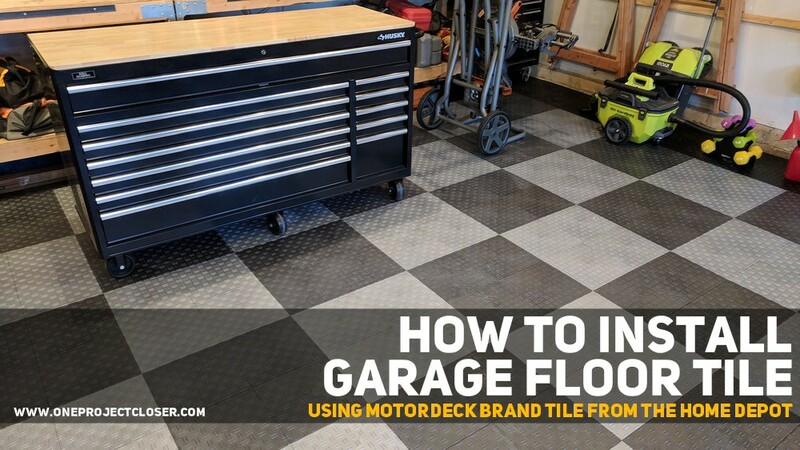 For complete installation instructions and additional pictures, visit our How to Install Garage Floor Tile tutorial. 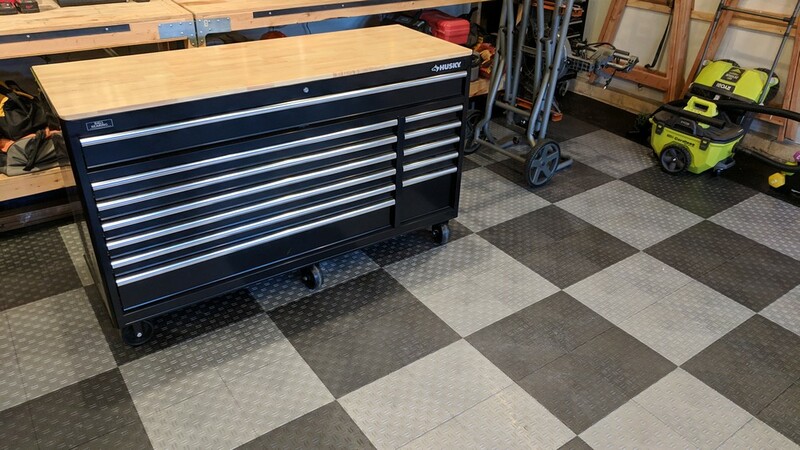 We intend for this article to be a long-term review of the tile that we’ll revisit in future years to see how Motordeck is holding up 1, 3, 5, and 10 years out! We hope that our initial impressions will be confirmed over the long run. Looks: So far the tile is looking fantastic. Sound: We installed Motordeck with a double layer of landscaping fabric between the slab and the tile. In reading several people’s posts about the tiles, we found one complaint was that the tile can sound “clicky” on the slab and that landscaping fabric tends to mitigate this. So far, so good. The double-layer of fabric has significantly muted any clicking sound from the tile. Clean-up: We also have found the tile cleans up really nicely. If someone tracks dirt or mud in on the floor, a quick cleanup with a damp mop seems to do the trick. The tile is also very easy to vacuum. Some sites promoting other garage floor methods have noted that plastic tile can dull over time. We’ll be looking for that with these tiles. Issues: So far, we’ve encountered no issues with the installation. We’ll be updating this post in March, 2020 with additional details on how our installation is performing! If we’ve forgotten, shoot a quick email to fred@oneprojectcloser.com and I’ll be happy to update it with a few pictures! Want to See More Pictures and the Installation? Check out our article on installing garage floor tile that features this Motordeck product. Motordeck Tile is available exclusively at The Home Depot and comes in 10 colors as well as two patterns (double diamond plate and coin). These links are affiliate links, so if you buy any product through these we get a small commission. We always appreciate it when you use our links to buy things as it helps us keep producing these guides and reviews! If you have an entry into the room you’re finishing, you’ll need an edging kit. Edging kits come in male and female varieties for use on either the hoop or peg side of the tiles.